The Root Canal procedure is an advanced technique that requires the utmost skill from a dentist who specializes in what is called endodontic treatment. The word “endodontic” refers to the soft pulp inside the tooth, and the goal of endodontics is to save your tooth, versus having the tooth extracted. New Look Dentistry offers skilled endodontic treatment including Root Canal surgery. My Tooth Hurts—Do I Need A Root Canal? Expert examination and diagnosis are the first steps. Please see us immediately if you experience tooth pain. The answer may or may not be a Root Canal. You may simply need a filling or other procedure may be needed because decay is close to a nerve– but our consultation is the only way to know, and protect the health of your teeth. Your mouth contains a vast, delicate network of highly sensitive nerves. So nerve activity, in the form of pain, from a damaged or diseased tooth may be felt in other teeth and even in other locations in the head, neck or ear. This aspect of expert diagnosis is the specialty of a dentist trained in endodontic treatment. Our dentist will interpret and diagnose the source of pain, then plan and carry out the most effective solution. 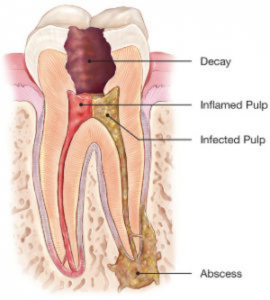 Inflamed or infected pulp inside the tooth requires endodontic treatment, in the form of a Root Canal. We determine this condition by an exam and X-ray. Sometimes infection inside a tooth is recurring. Trauma (impact to your tooth during a fall or car-accident, for example), deep decay, or a cracked or broken filling may introduce bacteria that causes inflammation and infection. Should I Opt For A Root Canal, Or Just A Simple Extraction? There are many advantages to saving your natural tooth. Keep in mind that an extraction is not as simple as you may think, since surrounding teeth and bone are affected when a natural tooth is removed from your jaw. We recommend taking steps to keeping your natural tooth whenever possible, and a Root Canal accomplishes this. With our expertise, a successful Root Canal can offer you pain-relief and long-lasting health and cosmetic results. If the pulp inside the tooth is damaged to the degree that it is considered dead, or when there is inflammation or infection in the roots of a tooth, and Root Canal is the chosen procedure, our dentist will carefully removes inflamed and infected pulp, then cleans, disinfects and shapes the root canals. The canals then are filled with biocompatible material and sealed, keeping the tooth intact. The treated tooth then is protected by a permanent dental crown. The procedure requires a consultation, and a few visits. The surgery itself will require the injection of a local anesthetic. As an option, a brief cycle of antibiotics may be recommended by our dentist, to help you resist infection. Then you’ll visit us a week or two after your surgery, to assure that complete and proper healing is underway. Here’s a cross-section illustration which shows why someone may need a Root Canal. The illustration shows areas of decay, inflammation, and infection at the root.